Have you tried a fruit crunch? 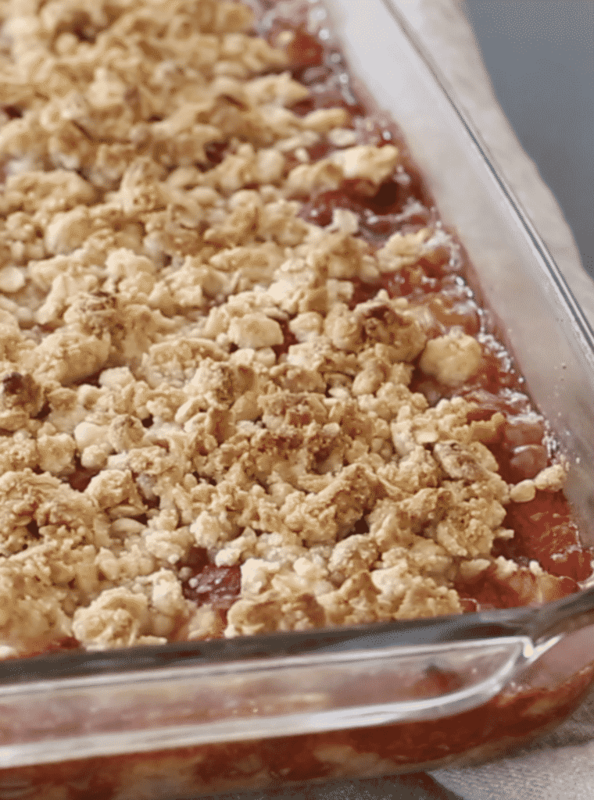 There’s an extra layer of topping that makes this Strawberry Rhubarb Crunch just a little more special than a fruit crisp. Fresh fruits tossed together with citrus and cinnamon sugar, then baked in between layers of a brown sugar and oat crust, this is my favorite way to bake fruit desserts. Almost firm enough to cut into bars and yet just fruity enough to still resemble a crisp, this is simply a fruit crisp with both a top and bottom crust layer. Don’t be intimidated by the crust layers or the topping, no cutting in cold butter is required. Melted butter is poured into the topping and it forms perfect crumbs to top this dessert. This recipe gets bonus points for being naturally gluten-free too. I tried rhubarb for the first time at a friend’s house several years ago. (Thanks, Rachael!) I absolutely loved the rhubarb and strawberry combination that she served for dessert. 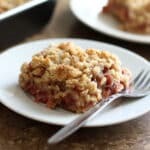 Remembering Rachael’s delicious dessert, I decided to adapt my favorite fruit crunch recipe to include some fresh rhubarb that I found at my local market this past weekend. Tangy, sweet and just a tiny bit tart from the rhubarb. I love this dessert so much; I have now added rhubarb to my garden list for next spring. Want a few more rhubarb dessert ideas? 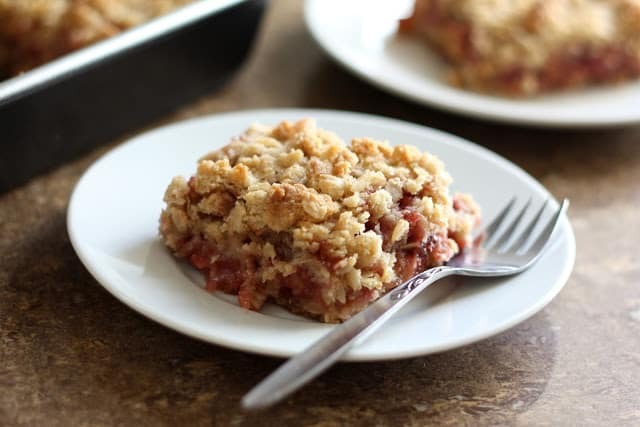 Rhubarb Crumb Bars are a light summer treat that you’re going to love having on hand. This Strawberry Rhubarb Pie recipe is a classic that you’ll want to save for strawberry season. Rhubarb Cream Cheese Muffins are a breakfast and snacking favorite with kids and adults. 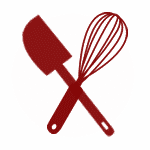 Do you have a favorite rhubarb recipe? I’d love to hear about it if you do. If you have an abundance of strawberries in the house, I highly recommend you try this Summer Berry Brulee. It is an unforgettable treat. Have you tried an herb sugar? I made this Sweet Basil Sugar with Fresh Strawberries a few years ago and it’s almost too good to be true. It’s a perfectly light and sweet treat that is pure summertime heaven. Preheat oven to 400 degrees. Place the fruit in a mixing bowl. Add the white sugar, cinnamon, salt, and cornstarch. Stir to coat and add the orange juice. Stir again and set aside. In a separate mixing bowl, combine the remaining dry ingredients and then add the melted butter. Stir to combine. Press half of this mixture into a buttered 9×13 pan. Pour the fruit over the bottom crust and then sprinkle the rest of the dry mixture on top. Bake for 30-35 minutes, until the crust turns golden brown. Scoop into bowls warm from the oven or let cool completely and slice into servings. In a separate mixing bowl, combine the remaining dry ingredients and then add the melted butter. Stir to combine. Press half of this mixture into a buttered 9x13 pan. Pour the fruit over the bottom crust and then sprinkle the rest of the dry mixture on top. Bake for 30-35 minutes, until the crust turns golden brown. Serve warm from the oven or let cool completely and slice into servings. Enjoy! To make this recipe gluten-free: Substitute 1 1/3 cups brown rice flour and 2/3 cup tapioca starch for the all-purpose flour in this recipe. This was my first time baking with Rhubarb. It came out perfect! I had a piece while it was hot Yum! Then refrigerate it overnight and cubed it up. That was awesome as well. It was a major hit. This is delicious! I've never done much with rhubarb, but this great. I actually used a gf flour blend, and halved the crust crumb recipe to make it in a 8x8 pan with the full amount of fruit. It was awesome. Will make again ❤I'm an author of YA Sci-fi and I'd love to post this on my website, with full credit and links, as my main character Sunny's favorite summer dessert. It looks below like this is ok, but if not, please let me know. Cheers! You're welcome to link to the recipe from your site, Karen. I'm so glad you like it! You don’t have to wait for spring. You can set out rhubarb roots early in the fall. Also I wouldn’t use a full cup of sugar, too much for me! I use3 cups of each and less sugar than that Also seems like a bit too much topping. I use 3/4 cup each of flour and oatmeal,, 1/4 cups each of brown sugar and butter. You could substitute some of the sugar with stevia. A little healthier. Can I make this recipe in a few days in advance or freeze it? Ive been making this every spring/ summer, one of my families favorite desserts!! I'll be making it for Easter next week, cant wait!! I'm so happy you enjoy this recipe!